To finish off our education topic of ‘Safe Transport’ today we are talking about aquatic creatures! We are lucky at BBEVS that we get to see a wide variety of animals, which includes amphibians such as frogs and axolotls, and even fish. 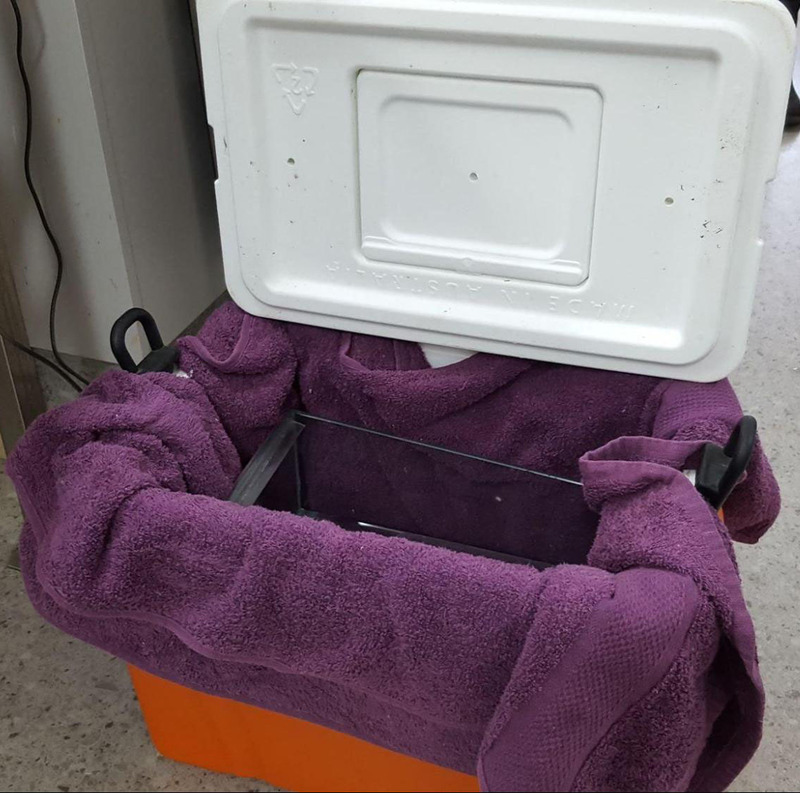 Fish and amphibians are not the type of pet that are often taken out for a ride in the car, so people are usually unsure how best to transport them to the vet! 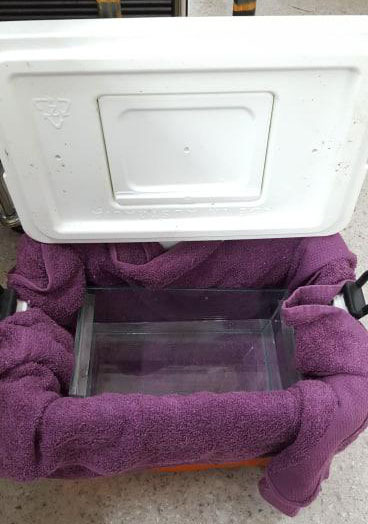 This is a great example of a setup for transporting fish. And with the addition of some icebricks, would also work well for axolotls! If you do not have a battery operated air stone for transport, we can aerate the water in our treatment area once they arrive. Terrestrial amphibians such as frogs are best transported on damp paper towel to prevent them from becoming dehydrated. Some plastic plants have been used here to create some hiding places. Fish must obviously be transported in water to be able to breath, so a bucket, plastic tub or esky often work well for these guys. The size of your fish will determine how large your transport container needs to be, but they should have enough room to move freely. The bigger the container, the better, as they will slowly use up the oxygen available in the water. If you are going to be spending a prolonged period of time in transit, then a battery operated air-stone would be ideal to ensure the water contains adequate oxygen. Filling the container with water from the tank ensures there will not be a sudden shock of change in temperature or pH, and the water should already be dechlorinated. If using water from the tap, ensure you dechlorinate the water and check the pH and temperature before transporting your fish. As part of your consult, we will often want to test the water quality from your tank at home. It is important to bring a separate water sample for testing, as the water in the transport container will quickly become contaminated with waste products. Axolotls also need to be transported in water, however they have some very specific requirements. Axolotls are very prone to heat stress, and are to be kept at temperatures under 16C. Water can heat up very quickly in transport, particularly in summer, so care must be taken to ensure the temperature stays cool. A plastic tub placed inside an esky lined with ice bricks works quite well. Alternatively a frozen water bottle can be placed inside the transport container. Other amphibians such as frogs breathe with lungs, rather than gills, and so should NOT be transported in water. Instead they should be transported on a soft damp substrate such as wet paper towel. A separate water sample from the tank is also important for water quality testing in the clinic. Given these are prey species they also benefit from some form of cover e.g. 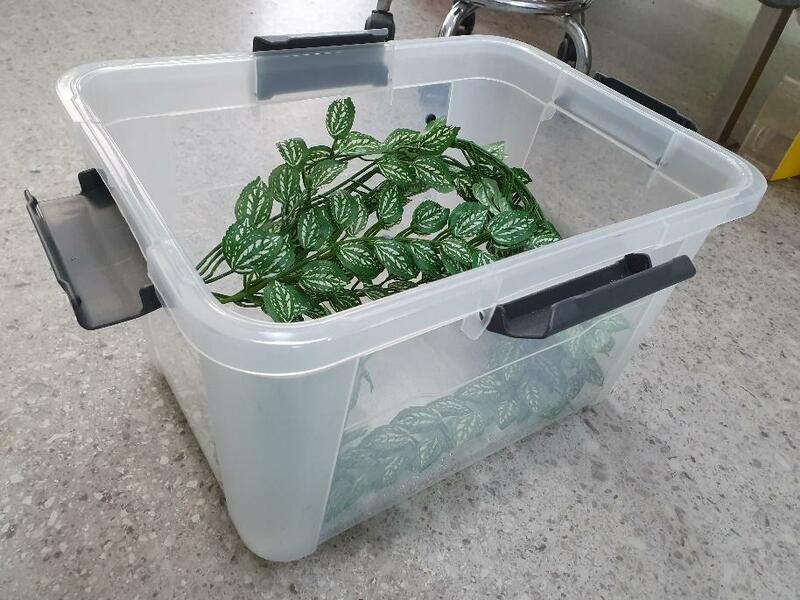 plastic plants to hide under. Be careful not to have heavy cage furniture in the transport cage as this can move and lead to injury. If you have any questions about transporting your pet to see us please don’t hesitate to ask when you book your appointment on 07 3217 3533.